The Australian saxophone quartet Compass offers its own trills … the baritone saxophone pounces on an iconic tango ostinato and the winds make like birds in Argentina. Joined by accordion player Marco Maio and guitarist Julian Curwin, Compass offers up a full set of tango originals. True to the spirit of the New Tango, these stretch the form from its roots as dancehall music to a more concert oriented sound. The scores—two by Maio and a suite each by Curwin and alto saxophonist Rose—are uniformly lush, more classical saxophone quartet than big band section. The sound never veers far from the tango verities, and all the melodies have the sound of something heard before, yet the arrangements are unfailingly entertaining. Maio’s “Tango One” is particularly intriguing with its splashes of sound and rough-neck sense of romance epitomized by a passionate tenor solo by Ottignon that summons the spirit of Gato Barbieri. Baritone saxophonist Luke Gilmour deserves a special nod for delivering such a fat and sure foundation. Maio’s accordion blends like another saxophone. Each of the saxophonists—including Leonard on soprano—has a say. The solos, though, emerge more from the ensemble, except on “Tango One.” I never sensed the soloists stepping out into the spotlight. Curwin’s concluding suite hews more to the traditional side, save for the brief largo. His writing favors more staccato articulation, barking at times. He opens up the last movement for solos from Maio and saxophonists Rose and Ottignon. It’s a fine conclusion to a session by musicians who celebrate the tango in their own voices. In the mid- to late-1900s, bandoneón player and composer Astor Piazzolla took the tango out of the brothel and put it onto the concert stage, and in doing so created the nuevo tango style that blended elements of jazz, western classical music and the traditional tango-music for the feet became music for the ears. Since then, the nuevo tango style and the music of Piazzolla have become incredibly popular (Arnazon.com lists more than 1200 recordings that feature the music of Piazzolla in some form). Saxophone quartet Compass have embraced the nuevo tango style for this release and have expanded their lineup to include accordion player Marcello Maio and guitarist Julian Curwin (from Monsieur Camembert and The Fantastic Terrific Munkie fame). The repertoire on this CD is all composed by the ensemble members: Miao contributes two works ("Tango Deu" and "Tango One), alto saxophonist Jeremy Rose contributes "Tango Suite", and guitarist Curwin contributes "They Know Not What They Do”. Far from being a matter of these performers doing a bit of composing "on the side", the compositions on this album are sophisticated and entertaining: Rose's "Tango Suite" and Curwin's "They Know Not What They Do" are each nearly twenty minutes long: these are not insignificant works for quartet. Highlights include the third movement of Jeremy Rose's "Tango Suite" - Julian Curwin's brilliant guitar effects create an ambience not usually heard on saxophone quartet recordings. The third movement of Curwin's composition features an acoustic guitar solo by the composer that adds great contrast to the saxophones. The performers on this recording are outstanding and the calibre you would expect from any ensemble that includes Christina Leonard, one of the best saxophonists in the country, The ensemble playing is generally tight; the tone is (deliberately) not the same as if the quartet were playing standard French repertoire. The ensemble is energetic, the tone bracing, even raucous at times - but this is what the tango is about. This is music with passion, not an etude by Bozza! As a classically trained saxophonist I am generally highly critical of saxophone quartet music. Like any recording of homogenous instruments (choirs, string quartets, brass quintets), seventy minutes of the same timbre can be tiresome on the ear: however, this album benefits greatly from the inclusion of the accordion and the guitar to give the ear another timbre to enjoy. This is very necessary as the album has the added problem of all the music being in the one style. To some listeners, after the first five minutes, the whole album will sound the same (regardless of the talent of the performers). But to those who appreciate good compositions and great playing, this album will not disappoint. So many saxes, so much time, these musicians work so well together. It's great to hear a sax quartet! Put them together with piano and guitar and it's magic. As for the tango, it is the music of romance. All originals, executed with precision, a delight for the ears! Altoist Jeremy Rose composed the wonderful four part Tango Suite and Julian Curwin the four part They know not what they do. There's drama and intrigue and frivolity. I remember watching Ross Maio in my youth at Italian functions marvelling at his skill playing the piano accordion. Of course, his partner Robyn, as they say, did the same only in heels! Its wonderful to listen to the progression of his son Marcello. He plays like a dream, and has written some superb pieces of music. Tango Deu and Tango One. What a recording; this is really worth listening to! The title of Compass' brand-new album, discreetly launched last Thursday night at Marrickville's Factory Theatre under the auspices of Joanne Kee's now well-established and respected Places & Spaces programme, refers to a particular move in the sultry dance meaning, literally, embrace. Certainly, much of the music contained on Abrazo Tango will caress and seduce you. A guilty pleasure, like Belgian chocolate, a mellow merlot or love in the afternoon. Sensual music, which contemplates, evokes and inspires movement, but it moves the mind, as well as body. In fact, it goes even deeper. The obvious comparison is with Argentine master of nuevo tango, the revolutionary Astor Piazzolla, but that's probably because, if any of us know one thing about tango, it's Astor. I'd even go so far as to say Compass is venturing into virgin territory, unfamiliar, even to the pre-eminent AP. Christina Leonard (soprano & alto) is a Coonamble girl who had her first lessons in Dubbo. She's in faculty at the con and a remarkably fluid player, soaring over the top of the ensemble in romantic swirls; which just goes to show you can take the Coonamble outa the girl. (Coonamblers, please resist the urge to correspondence.) You're just as likely to see her in the SSO throng, or in the pit, for the Australian Opera Ballet orchestra. She's played overseas, philharmonically, is expert in baroque woodwinds, has recorded with the likes of Matt McMahon and lends this ensemble a mellifluous forward motion. Jeremy Rose, on alto, seems like a very serious, intense & somewhat pedantic young man (in a good way); certainly, noone could question his skill, as instrumentalist or composer. Like Leonard or, for that matter, say, Robert Fonseca, Rose took up music very early (piano & clarinet at six; sax at twelve). That depth tends to show through, in his many and various projects, like The Vampires, which might very well be the only band in the world top concertedly focus on jazz-reggae. He also has a list of awards, scholarships, honours and achievements as long as your arm (longer, if you're Danny de Vito). Matthew Ottignon, tenor, is, of course, one of the fabulous Ottignon brothers, who are too, too talented for my liking! Well-known to me for his work with the late, lamented Jackie O, he's also associated with Blue King Brown and songbird Katie Noonan, not to mention having played with weirdo-savants, Lou Reed and Brian Wilson. And, thanks to his versatility, he's part of the furniture in the eccentric, fun, gypsy-folkdom that is Monsieur Camembert's cheesy, but tasty world. Luke Gilmour, baritone, might look like a mild-mannered accountant, but he plays like a demon, supplanting bass with the rasp of the devil himself and sporting a rhythmic drive that underpins the whole shebang, with a rock-solid, pedal-to-the-metal momentum. Speaking of which, for his orchestral work, Momentum, a year or two back, he received the fellowship of Australian Composers award; pretty auspicious for such a young graduate. Perhaps it's his naval (ships, not gazing) experience that has tailored his Kentish appearance, whereas he's really a veritable caped crusader. Indeed, it's his sound that lends much of the predatory sexual aggression so characteristic of tango. Maio is a 22-year-old prodigy of piano-accordion, with a dauntingly polished technique; almost as daunting as his compositional expertise. it's easy to see why this jazz-piano-trained muso is in such cross-genre demand. Curwin, of course, co-founded ARIA-winning Monsieur Camembert, but has more strings than a zany zither. Perhaps you know of his heavy metal lounge band, Darth Vegas; electro-acoustic experimental pop delicacy, Gauche; or quirky tango-punk chamber-jazz ensemble, The Fantastic Terrific Munkle. If he lacks anything, it's not a sense of humour. His delicate touch, amused and amusing approach, as well as gentle experimentations with loops, kept things lively, particularly during the warm-up, heavily improvised set by he & Maio. All-in-all, Compass is a fascinating, exciting & inspiring project, especially in concert with Maio & Curwin. One gets the feeling they've only touched the tip of the iceberg ('though an ironically cool analogy in the context of tango) in collectively exploring their mould-breaking hybridization of classical, jazz and tango. In practice and, especially, onstage, it's a protein-packed fashioning of composition, arrangement and edgy, seat-of-the-pants impro. It's dynamic, sometimes sublime and reaches the parts so much other music can't, with an alchemical, near magical intimacy that is the very stuff of passionate desire. 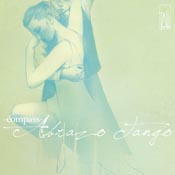 Coming to the pieces themselves, the opener (on the album too), Tango Deu, by Maio, tangles with the sway of the dance: even if you'd never witnessed entwined Latinos commanding a floor, you'd instinctively mimic and chime with the essential shape of the movements. Gilmour's baritone lays down a rhythmic railway track, with altos and tenor tumbling over the top, intermingling in the same inseparable way dancers, or lovers, would. It's a beautiful cacophony of melody, which sounds utterly paradoxical, but is about the only way I can think of describing it. It has jazz harmonies, an Orleans-like flavour, as well as a classical stateliness and sophistication. Sounds complex and contradictory, on paper, but is superb, in the musical telling. This music casts a double-strength spell. Not only does it have the irresistible appeal of tango but it contains some brilliantly imaginative writing and intriguing arranging for a saxophone quartet. The intrigue is partly due to having two classical saxophonists in Christina Leonard (soprano, alto) and Luke Gilmour, (baritone), joined by two jazz saxophonists in Jeremy Rose (alto) and Matthew Ottignon (tenor), with the consequent juxtapositions of tonal quality and approach. The upshot is a fattened collective sound, further expanded by accordionist Marcello Maio and guitarist Julian Curwin. The superb pieces have been composed within the band and, in the tradition of Astor Piazzolla's 'nuevo tango', stretch the rhythms to (back-)breaking point. The horns, meanwhile, curl around one another in dramatic precision, or explode in joyous or sultry improvisation. The whole is cushioned - and made more accessible - by the svelte guitar and swelling opulence of the accordion.